Here are another seven hand-dandy tricks of the aeromodelling trade. 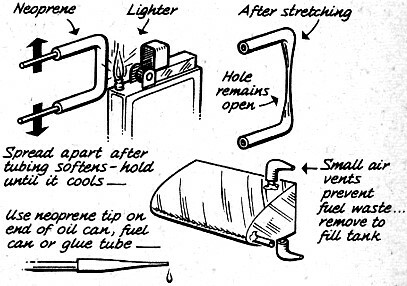 As with many of the tips and kinks offered by readers of the era, some - if not most - involve materials and/or methods that have long ben replaced by more modern means. 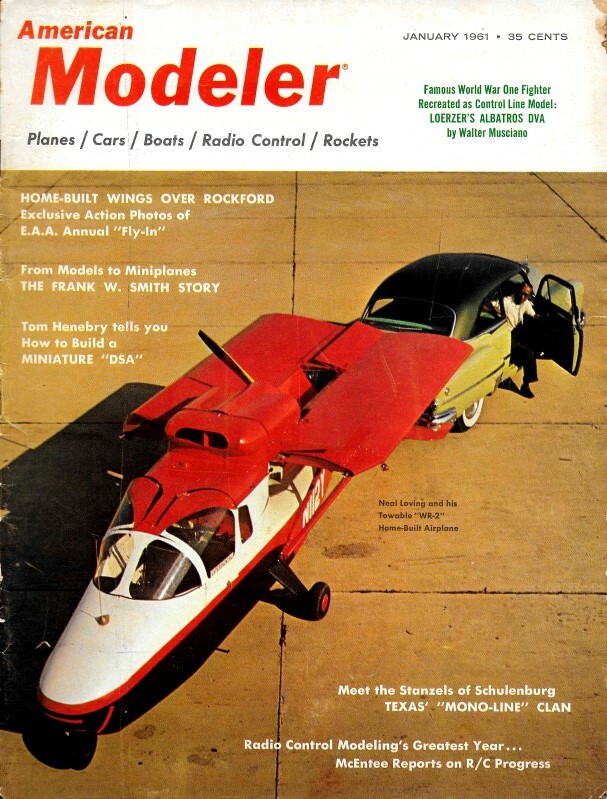 Still, you might find something useful in the extensive collection from vintage American Modeler and Air Trails magazines (see list at bottom). William Gilgore of Hellam, Pennsylvania, adds perfect fillets to models by applying ready-made leather fillet straps as used by patternmakers. Sizes range from 1/8 to 3/4 inch. Strips add strength. 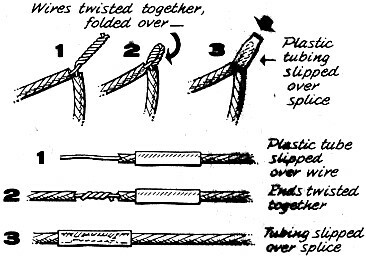 Wires twisted together, These quick and simple wiring splices are next best thing to a soldered joint. Firmly twisted wires are covered by tight-fitting plastic tubing. Contributed by Thomas Pinto of Staten Island, New York. 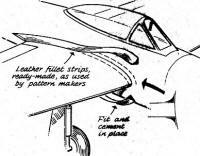 Japanese modeler K. Wakatsuki, Toyko, submits his method of stretch-forming canopies, wheel fairings, etc., of celluloid or plastic. Important to secure sheet firmly over face of cut-out. The precision free-flight flyer will appreciate tip sent in by Harry Murphy, Jr. of Anderson, Indiana. Screw adjustment allows close trim of stab tilt for precise glide turn control. 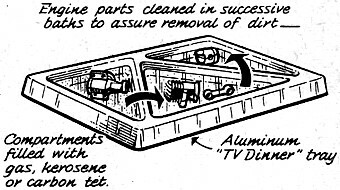 Hang on to used "TV Dinner" trays; use them to wash model engine parts says Michael Elliser of Bayside, New York. Loosen most dirt in first and second baths, final rinsing in clear third one. After discovering that neoprene tubing could be heated and stretched to small diameters, George Holeton of Calgary, Alberta, Canada, used tapered tubes for various model uses. 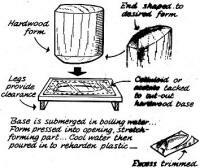 Simple solution to knotty problem by. Richard Miller, New York City. 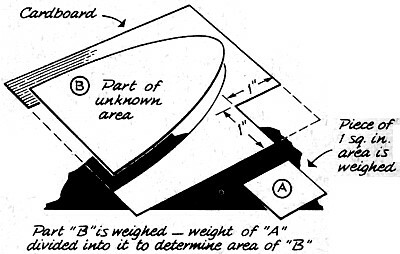 Area of irregularly shaped part can be determined closely by comparing weight of pattern with known weight of square inch part. 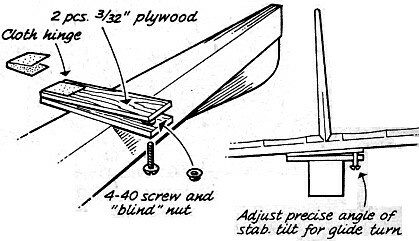 Got a new idea for construction, adjustment or operation of model planes. boats or R/C? "AM" pays $10 for each "hint & kink" used. Send rough sketch and description to Sketchbook. c/o American Modeler, 575 Madison Ave., New York 22, N. Y. Please note that because of the very large number of submissions, none can be returned to the sender.